Several times a year I find myself standing in front of my closet feeing the urge to throw away everything I own and start all over. I recognize those moments for what they are; bad days, poor planning for an event, or straight up PMS, so it’s easy to ignore the urge. Then there are other times in our lives where we truly go through a change in our job situation, life, or relationships, and our old wardrobe just doesn’t fit. Lately I’ve found myself in that type of a spot. I work from home or a coffee shop and pretty much dress for myself, the few meetings I have a week are usually with clients that are also in creative fields and dress in a fairly relaxed way. Most of my wardrobe though leans heavily to the corporate/professional side, so I’ve been slipping into the bad habit of wearing the same jeans and alternating between a few sweaters on days that I’m not going out (hence, less outfit photos on the blog). Like most people I don’t have unlimited resources to go shopping, but I do have a plan…..
I’ve started by pulling out any dresses and suits from my closet that can be consigned. Not a lot of my pieces are high end, but I do have some items at the back of my closet from my corporate days that might help me get a little money into the pot to get started. Last weekend I also did a really good closet purge and clean out and just got rid of any pieces that I haven’t worn in a year and weren’t vintage or memorabilia. The next step is to stop and think (do not shop yet). Most people make the mistake of rushing out to shop when they are in the “re-invention” phase, I like to sit and incubate for a while. Start a list of things you wish were in your closet, add to it when you are getting dressed, not after the fact. I have a little post it stuck to my closet door right now for this purpose. Start gathering inspiration, create pinterest board or cut out pictures you like and glue them to to a scrapbook (I do both). Be sure to collect ideas and pictures until you start to see a pattern. You aren’t ready to shop until you start seeing similarities in the types of images you are saving. 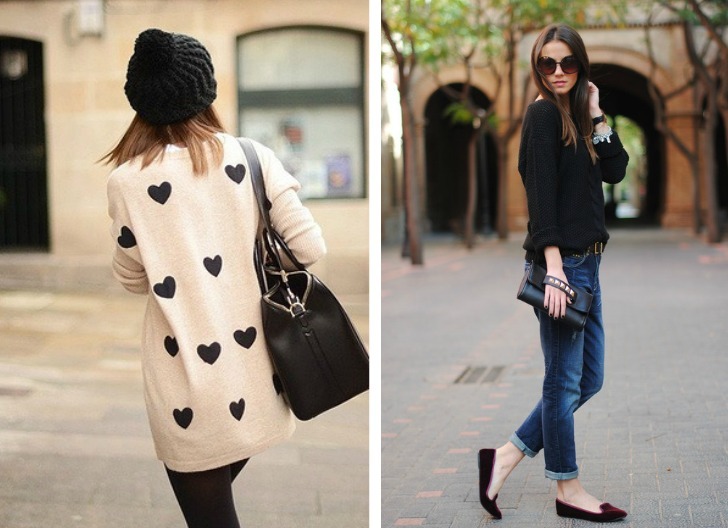 Since I’ve been thinking about my “new look” for a few weeks now, I’ve started to notice the patterns; leather look tights, cozy knits, boyfriend jeans, really fun flats, and lots of hearts. My style direction for 2014 will definitely have a decidedly casual vibe, but I still want to have something special and edgy in all my outfits, you know like a girl that writes a fashion blog. Once you have a direction in mind, set a budget, and then plan a shopping day (or spread it out over a few months like me), however, do not go shopping without a list! This isn’t a free for all, you still have to consider if the pieces that you are adding into your wardrobe will play well with what you already own. That is unless you are a lucky duck that can run out and replace your whole wardrobe! Boy do I wish I could do a complete wardrobe overhaul. I have not really shopped for anything in over 5 years! There may even be the odd maternity shirt still kicking around in the closet. Anything I have bought has just been casual every day clothes (that means yoga pants, tshirts and tank tops mostly). With 3 kids to buy for – almost every 4 months for my growing 4 year old — mama just misses out right now. I love it! And I love that you are gonna be offering that as a package now that is awesome!